Did you know the CLAMS Library Network has thousands of ebooks and audiobooks? Go to clamsnet.overdrive.com for titles. You can borrow them, instantly, for free, using just the device in your hand. It takes just a few taps to find and borrow a book. Libby has a ground-breaking built-in ebook reader, and a beautiful audiobook player. If you prefer, you can send books to your Kindle for reading. —- Libby is the brand new app from OverDrive Labs. We’re trying to simplify and bring joy to every aspect of digital borrowing and reading. If you love it, you can use it instead of the OverDrive app. 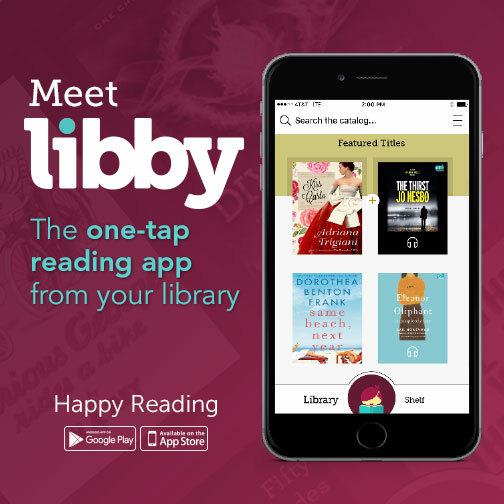 If you don’t love it yet, feel free to keep using the OverDrive app, but check in on Libby from time to time — we’re adding features and squashing bugs every day. Happy reading. This entry was posted in Digital Media, eBooks, Featured and tagged overdrive. Bookmark the permalink.